There can be few more peaceful pleasures than relaxing in your favorite armchair while the room you are in is made cozy and warm by a nearby space heater. However, if that heater is noisy due to moving parts, such a fan, then it can feel far from peaceful. The solution is a space heater which doesn't make much, if any, noise, and this article is going to help you choose one. We'll review some of the best quiet space heaters on the market, plus give you some tips and advice on how to select the right one in our buyer's guide. 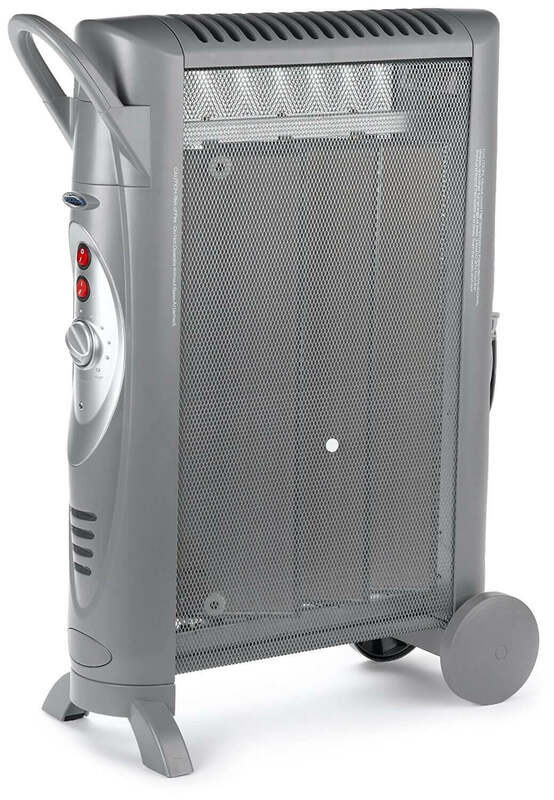 This is a light and portable micathermic panel space heater which could be used in just about any room in the house. Its portability is due to the fact that it is lightweight, and it also has wheels, so it can be moved easily from room to room. If you prefer to have it permanently located in just one room, then you have the option to fix it to the wall using its wall mounts and the kit which you use to secure it. It has two heat settings and on its higher setting, it can produce around 5,100 BTUs of heat. These settings are selected using one of the two dial controls on the side of the heater. The other dial allows you to adjust the thermostat to get the temperature just right for you. As the heat that is created radiates out into the room, there is no need for a fan, therefore, this heater runs almost silently. One of the quietest space heaters that you can have are oil-filled radiators because they have no moving parts, no fans and the only noise you might hear is the occasional creak as the metal radiator heats up. Beyond that it is silent heat. This is a 'plug-and-play' space heater, which means all you need do is plug it in and it comes on. The radiator has two control dials. The top one is to select one of the three heat settings that it has, and the other is the thermostat which lets you fine-tune the radiator until it gets to a level of heat you are happy with. It is mounted on four casters, so if you want to take it with you into another room you can. In the warmer months when you do not need the heater you can remove the casters for easier storage. There is also a handy cord tidy for when the heater is not being used. This radiator is sealed, therefore there is no need for you to refill it with oil at any time. With its digital control panel and LED display you could easily mistake this oil-filled radiator for a PC tower, however, it is definitely a heater and a very quiet one at that. The main reason is that, unlike a PC, this does not need a fan. Instead, it heats up the oil inside and that heat then radiates out and into the room. You can regulate that heat using the aforementioned digital control panel. This lets you alter the heat up or down to a maximum output of around 5,2100 BTUs. You can see which settings and temperature you are selecting on the LED display just above the control panel. This can also be used to program the 24-hour digital timer. There's even an auto switch on feature which activates when the temperature in the room drops below 44°F. You never have to worry about refilling with oil as this is a sealed unit, and should you wish to use it in more than one room you don't need to lift it, as you can wheel it through. While our last heater reminded us of a PC tower, this one does a very good impression of a toaster. It is one of the oddest looking space heaters we have ever seen, but it is quiet, which is what we want in this category. 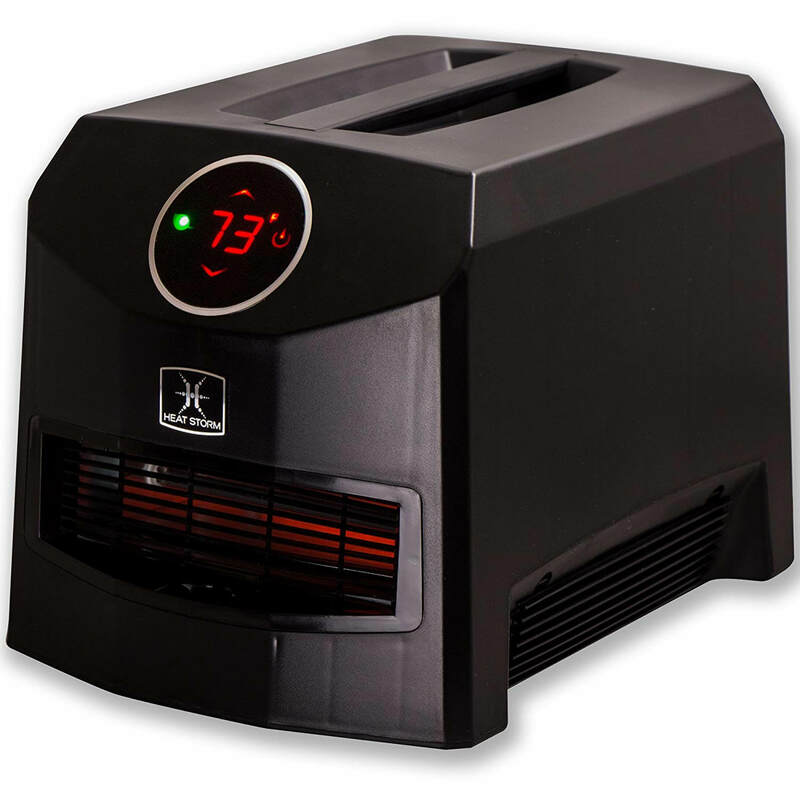 It is an infrared heater with a fan which might suggest it is noisy, but all tests and customer reviews show that it is one of the quietest fan heaters available, especially as it has a low-speed option, which can be selected instead of high speed. The other controls allow you to adjust the temperature settings, which you monitor using the LED display on the front of the heater. For those of you that love all your home comforts, you'll be pleased to know there is a remote control with which you can adjust the thermostat up or down. This another oil-filled radiator which is extremely quiet to the point of almost being silent. It is a sealed unit, so there's never a need to refill it. As is normally the case with this type of space heater, the controls are very simple to use. One lets you choose one of the three heat settings with the heater capable of producing up to 5,100 BTUs. The other control dial lets you adjust the temperature until you have it at your preferred level. It can easily be wheeled from room-to-room due to it having four casters. When you wish to store the heater during the summer, these casters can be removed. When stored there is also a cord wrap to keep the power cord from getting tangled or damaged. For safety, there are two cut-off features. One is to guard against overheating, and the other will switch the heater off if it gets accidentally knocked over. Our final quiet space heater is a micathermic panel heater from Bionaire, whose grey color and modern styling make it look very impressive. 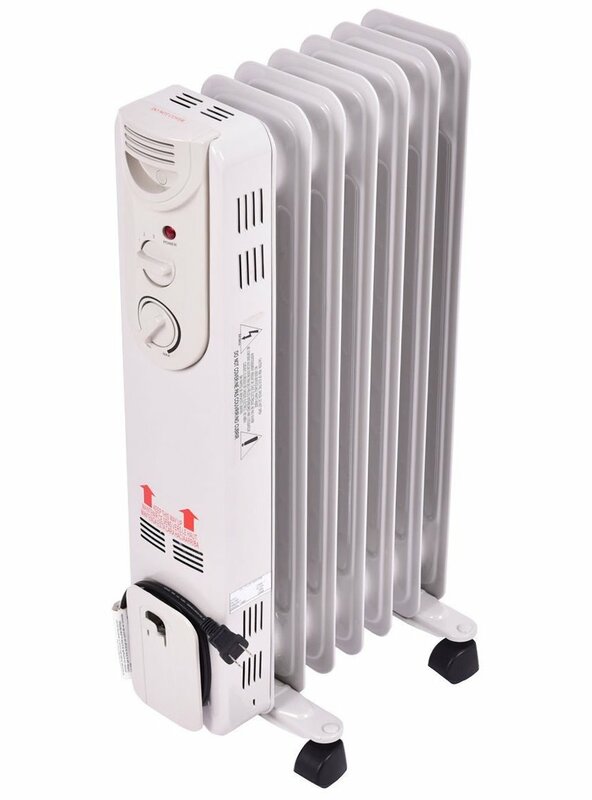 Unlike most other portable heaters which have four casters, this one has two large wheels on one side. To move it you lift it from the other side and push or pull. This means it should be more stable when it is sitting on the floor. If it should get knocked over, there is a sensor which will turn off the heater to keep it safe, and there is also a sensor which does a similar job if the heater is in danger of overheating. It is virtually silent when it is on due to its micathermic heating process which requires no fan. To control the heat, you have a button on the side which lets you select high or low, and there is also a thermostat dial which you can use to adjust the temperature to suit. The term 'quiet space heater' doesn't refer to an actual heater type in terms of how it produces heat. Instead, it is used to specify a feature of these heaters. This often begs the question about what sorts of heaters there are which are quiet and how do they work. Read on and these questions will be answered. These quiet heaters produce heat by heating a metal heating element which is housed in thin sheets of mica. Mica is a naturally occurring silicone based material which is found in a crystal-like form. Apart from heaters, it is also used extensively in the electronics industry as it is an excellent insulator. In heaters, once the mica has been heated up, it then distributes that heat using both radiant and convection methods. Micathermic panel heaters are normally light enough to be moved easily, especially as most of them have casters so they can be wheeled from room-to-room. Although it uses convection heat, they normally don't have fans which help them to be very quiet. These are usually sealed units, which as the name suggests are filled with oil. When it is switched on the heating element starts to heat the oil. The heat generated then transfers through the metal body and radiates into the room which the heater is standing in. Oil-filled radiators are easy to control, and they are also portable as most of them have casters which allow you to wheel it around. As they are portable and relatively small, there is a risk that an oil-filled radiator could get knocked over. If this happens there is a sensor which switches the heater off immediately. These are very popular heaters which produce heat very efficiently. They are regarded as one of the most energy efficient heaters available which may account for their popularity. Infrared heaters work on the principle that the heat they produce radiates out into the room. Unlike convection heaters where the heat is blown out into the room and heats the air, an infrared heater radiates its heat. This means the heat goes out directly and rather than circulating in the air, it warms up whoever or whatever is in line with the radiating heat. The most common reason why any space heater is quiet is normally down to the fact that it has no or very few moving parts. The moving part of a space heater that is the most notorious noise maker is the fan. Fans are an essential part of most convection heaters such as ceramic space heaters. There are two sources of the noise the fan makes. The first is the motor which will make a noise as it is spinning. The second is the noise created by the blades of the fan spinning quickly and their interaction with the air around them. In some heaters with fans, the noise will be barely noticeable, but with others, it can be so loud that it becomes extremely distracting, not to mention very annoying when you are trying to relax or watch TV. None of the space heater types we mentioned above requires a fan, so that eliminates the biggest source of noises. That is not to say that some won't have fans, like the Heat Storm Mojave heater, but these will be very quiet. Quiet space heaters will make the occasional sound, but they will be very quiet and subtle. These sounds could be the thermostat clicking on and off, or the metal parts of the heater creaking as they expand due to the heat. Space heaters are a very safe way to help heat the rooms in your home, but even so, here are safety tips which you should be aware of and follow. This advice is given in relation to just about every electrical appliance that has a power cord, and all quiet heaters come under that umbrella. The danger with extension cords, especially when they are being used with heaters, is that they can overload and start a fire. As all the quiet heaters we reviewed are portable so there should be no reason why you wouldn't be able to find a suitable power socket that can be used to power them. Most quiet heaters are also relatively small, and lightweight. This means they are perfect obstacles for people to trip over or bump into and knock them over. This is less likely to happen if you position your quiet space heater where no one in your home is not likely to be walking. One of the ironies of having a quiet heater is that it is difficult sometimes to know whether it's on or not. There is nothing moving and making a noise and if there is no power or heat light, what can you do to check? The answer is to carefully move the back of your hand towards the heater. This side of your hand is more sensitive to heat than the palm of your hand and will soon let you know when it is getting near to anything which is hot. Just as we mentioned that it could be difficult for you to know if your space heater is on due to a lack of any noises coming from it, the same will be the case for children. The risk is that they think that because it is quiet, the heater is off and touch it. This could lead to them knocking it over, and injuring themselves, or another child if there are others in the household. The other danger is that they touch a hot part of the heater and get burned. Thankfully, most space heaters are 'cool to the touch', but not all are. The safest route is to teach children that heaters can be dangerous and that they should not touch them under any circumstances, even if they think it is switched off. Whenever you switch off the heater, always make it a habit to unplug it from the power socket. This is the advice all electrical safety experts give for just about every electrically powered item. Apart from avoiding any potential electrical fire risks due to a power surge, you will also be saving money on your power bill. If there is one thing that all these space heaters have in common, it was how quiet they all were when they were on. Having compared them all to each other our choice for the best quiet space heater goes to the DeLonghi HMP1500 Mica Panel Heater. Apart from having the best-looking design, this space heater is silent, apart from the click of the thermostat coming on and off. It is very easy to use, and easy to move, thanks to two large wheels. The design of the base means this heater has two legs on one side which ensures it will be stable on most flat floor surfaces inside your home or in your office. Last, but not least this quiet heater has safety sensors to prevent overheating, and to switch it off if it is knocked over.